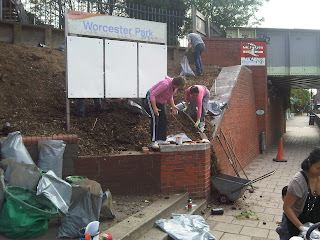 Earlier this month I reported on the the Worcester Park Station Volunteer Group who are giving their time and energy to clear up and plant out the area around Worcester Park Station. 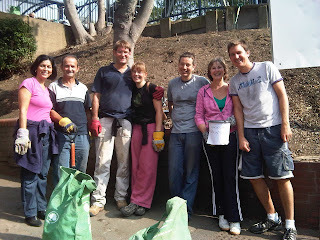 They were hard at work again yesterday with 9 enthusiastic volunteers turning up to continue the clear-up work. The group has now expanded with 15 volunteers signed up to work on the site and has received numerous offers of free plants and shrubs from people in the Worcester Park community. The group even managed to raise £50 from approving passers by at the station on Sunday - money which is being put towards the various materials the group will need to complete the job! The group is currently in the process of setting up as a charity and will be a featured charity in the Waitrose collection for October, so please show your support by putting your green tokens in their bin! Now that all the heavy clearing work is done, the group are deciding how to plan the planting of the site. The site is on a slope, so if there is a landscape gardener who would be interested in advising the group they'd be delighted to hear from you.